The Cisco Cius will be available to Verizon enterprise and government customers around the world later this summer, and those located domestically will be able to combine the device with a Verizon Wireless 4G LTE mobile hot spot. 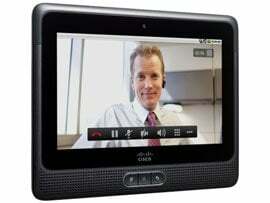 Designed for the enterprise, the Android-based Cisco Cius combines voice, video, collaboration and virtualization capabilities on one device. When powered by Verizon's 4G LTE network, mobile workers will be able to easily use bandwidth-intensive video applications – including between devices – for more effective collaboration. "Mobile applications over intelligent high-speed networks will continue to eliminate barriers in the workplace," said Mike Smith, vice president for Verizon enterprise communications, network and mobility sales. "We're forecasting a perfect storm where advanced enterprise tools such as the Cisco Cius mesh with the speeds made possible by 4G LTE to make the virtual office a more robust reality than ever." Government: Tablets can increase productivity of government users – from military to civilian government field workers to emergency first responders – allowing them to enter information or share it quickly with remote offices to complete the business of government more efficiently. Through Verizon's Managed Mobility portfolio, enterprise customers can securely deploy a wide range of devices to employees. Capabilities include device management; expense tracking management; lock and wipe features for protecting sensitive data; and mobile delivery of popular business and consumer apps from the cloud. In addition, the company offers a full suite of professional services to help organizations create policies and design mobility programs to suit varied requirements.